The Faculty of Science and Fermilab announced an agreement to jointly appoint a scientist who will participate in the Deep Underground Neutrino Experiment (DUNE). York is the only Canadian university currently involved in the international DUNE collaboration spanning 31 countries. 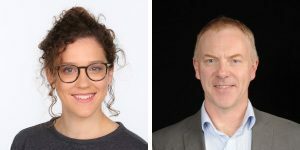 After receiving an overwhelming, global response to its first-ever call for Science Communicators in Residence, the Faculty of Science announced its inaugural residents: Kate Allen, Science & Technology Reporter at the Toronto Star, and Matt McGrath, Environment Correspondent at the BBC in the UK. The Faculty launched a new YouTube channel called DID YU KNOW, where our scientists answer quirky science questions. The Faculty of Science launched its call for applications to the York Science Fellowship program. These premier postdoctoral fellowships are intended for talented early-career scientists who have recently been awarded, or who are about to be awarded, the doctoral degree. The deadline to apply is November 20, 2017. Wendy Taylor (Physics & Astronomy) is part of the team that received a $29M grant from the Canadian Foundation for Innovation for the project “Upgrades to the ATLAS Detector at the Large Hadron Collider.” A project initiated by Thilo Womelsdorf (Biology) also received more than $3M from CFI to establish a Centre for Neuro-Behavioral Monitoring. Chun Peng (Biology) participated in the Biotechnology in Health Research Reception hosted by Research Canada. She presented “The Revolution in Precision Medicine: Data, Diagnostics and Personalized Care” at one of the four kiosks set up at the event. Dawn Bazely (Biology) organized the third celebration of International Ada Lovelace Day at York University. Diethard Bohme (Chemistry) delivered the opening talk of the two-day symposium SN2 Reaction Dynamics at the Regional American Chemical Society Meeting. His talk, “SN2 reactions: first steps from solution to the gas phase and back again,” focused on his pioneering experiments performed 50 years ago that observed and measured nucleophilic substitution reactions for the first time in the gas phase. Chris Lortie (Biology) published Idea farming: it is a good idea to have bad ideas in science in Ideas in Ecology and Evolution. Trueman MacHenry (Mathematics & Statistics) presented a talk at the annual Algebra Conference for the Americas in Ecuador. Mary-Helen Armour (Division of Natural Science) presented “Geophysical Signature of Suspected and Confirmed Impact Structures, Ontario, Canada,” “Ebooks as a Mandatory Text in Large First Year General Education Geoscience Course,” and “Investigating Student Perspective And Experience With Online Geoscience First Year General Education Science Courses” at the Geological Society of America Annual Meeting. YFile profiled the new ISCInvolved leadership program for students in the Integrated Science program. Peter Backx (Biology) presented “Exercise and the Heart: What Every Sports Buff Should Know” at York Circle Lecture and Lunch Series. Hélène Mialet (Science & Technology Studies) presented “Sensibility, Body and Attunement” for a panel she organized at the Society for Social Studies of Science. She also co-authored A Sense of Balance: Techniques and Technologies of Self-regulation in Transmissions. SEEDs at YorkU, founded by Sapna Sharma (Biology), hosted 45 family members from Chechnya, Syria, Sudan, Ethiopia, and Saudi Arabia to a special, behind the scenes tour of the Toronto Zoo. Ed Furman (Mathematics & Statistics) and co-authors published the first attempt to formulate a class of coherent and comonotonically additive measures of risk that quantify both the magnitude and the variability of the tail risk. Dawn Bazely (Biology) spoke to Metro News and CBC News about why we likely won’t see splendid fall colours this year. Amro Zayed (Biology) spoke to The Globe and Mail and Nature News, among other outlets, about a new study (which he was not involved in) that discovered that much of the honey around the world contains neonicotinoid pesticides. Niagara Falls Review profiled undergraduate student Victoria Van Dyk (Physics & Astronomy), who received a grant from the Canadian Space Agency to participate in the International Astronautical Congress in Australia. She was one of 10 Canadian students attending the conference. Dean Ray Jayawardhana authored the op-ed When Worlds Collide, Astronomers Watch: New ways of seeing what happened 130 million years ago in The Wall Street Journal. Paul Delaney (Physics & Astronomy) spoke to CJAD and AM640 radio about 2012 TC4 asteroid’s close approach, as well as to the National Post about Lunar Lava Tubes. Nov 20: York/Gairdner Neuroscience Symposium: http://gairdner.org/events/gairdneryork-university-neuroscience-symposium/ . Faire/Fecan Theater, Accolade East, York Keele Campus.